Tinyard Enterprise Co.,Limited is one of the top level China 3-side-seal bag making machine manufacturers and suppliers, welcome to wholesale 3-side-seal bag making machine from our factory. This machine combined the advanced technology of another bag making machine, so its highlight point is full automation in all the procedure from film roll to finished bags; and multi-functional: it could be adjusted to make 3 side seal bags, pillow type seal bags, and fashioned standup pouch by attaching some special devices. So its application range is very wide and performance is great. This machine is very suitable for special bag-making factories, large foodstuff processing companies. With photoelectric tracking and auto deviation rectifying, its finished bags are much regular and well and the wastage rate is much low. 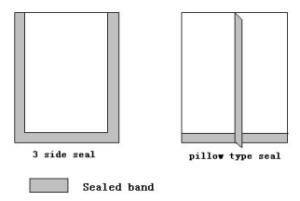 --It can automatically make the 3 side seal bags, pillow type seal bags (back seal bags, and standup pouch by changing or attaching some special devices. The output of this machine could achieve max. 180bags/min. --With photoelectric tracking and auto deviation rectifying system, it could make the bags accurately and fast. --Adopt PLC system, keyboard and computer screen to control the machine, which has the advantages of easy adjustment, simple control for operator. I)No.17 part, is the film roll bracket and feeder. II)No.14-16 parts, is used to slit film into two portions, which will be the top and bottom pieces of 3 side seal bags. This part is unneeded when making pillow type bags. III)No. 13 part, is used to place, wind and insert the bottom film of standup pouch. This part is unneeded when making 3 side seal bags or pillow type bags. IV)No.1-12 parts, is the master machine, which could finish the following steps of bag sealing and cutting.